Our original plan was do a long, tough dayhike up Whitewater Canyon in the San Bernardino Mtns to tag Peak 7,054ft, a lingering P1K, and possibly Kitching, an ex-HPS summit. It seems we were late in realizing one needs permission to drive in to the TH before 8a and the plan fell apart as I was driving to pick up the wife at LAX and then to Tom's place the night before. We settled on a plan I had cobbled together while waiting for her plane to arrive, involving a bunch of minor summits around Lytle Canyon at the east end of the San Gabriels. I had routes loaded in the GPS covering 8 or 9 such summits, some drive-ups, others not, but we only managed a few of them in the end because our first effort turned out to be much harder than expected. This first outing was supposed to be something of a warm up, less than five miles and about 3,000ft of gain. The two peaks are located on the south side of Lytle Canyon's North Fork. We drove about 10mi from Interstate 15 to a turnout northeast of the side canyon spilling down from middle of the circuit we intended to hike. 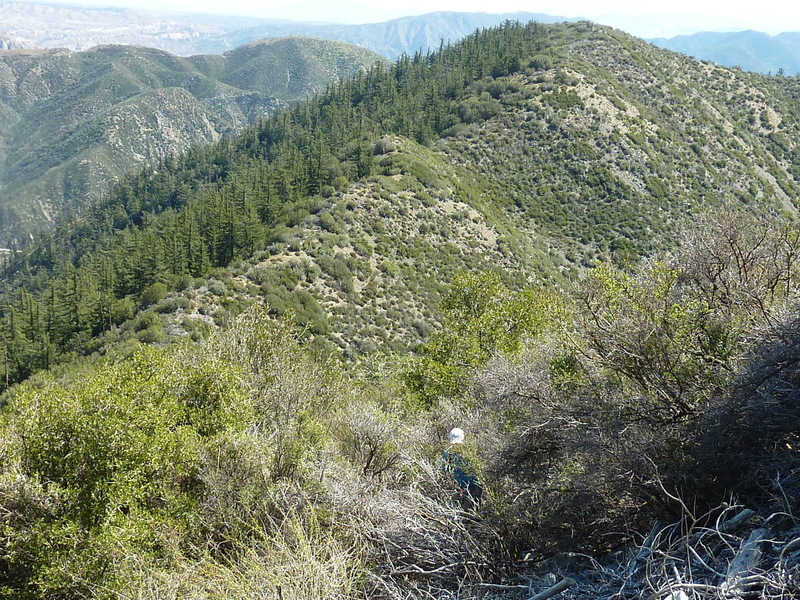 While the north side of the Lytle Canyon had seen significant fire damage the previous summer, the north side was left untouched and consequently well-stocked with the usual brushy armor these hills usually wear. The view from afar showed stretches of talus, trees, and clearings that made it seem like the bushwhacking sections should be short, but upon closer inspection it became otherwise. This same impression, the reverse of what one usually finds in brush country, would be repeated several more times before we were through. We crossed the wide, gravel and boulder-strewn streambed of the North Fork, weaving through the tall brush growing there. The ground is littered with the refuse of unrestricted shooting practice that appears to have been rampant here at one time. It was this shooting activity that got Chalk Peak delisted from the HPS list several times now. A professionally managed shooting range is now found just up the road from where we parked with a permit from the USFS and is the only legal place in the canyon to shoot. The range is large and the gunfire almost continuous, making for quite a racket that we could hear for almost the entire outing, but at least they weren't shooting in the streambed. Upon reaching the far side of the stream we started up the north slopes of Peak 5,428ft and almost immediately got separated as we preferentially found differing lines of ascent that seemed most workable. The going was steep, the brush not horrible but a little troublesome, and the scree we encountered in its place not much better. 30min after starting up the slope the going got better as trees appeared, the brush and gradient lessening. It was 9:15a when I finally reached the rounded summit, views open in all directions. The snows on the backside of Cucamonga were particularly striking to the south. I hadn't seen the others since shortly after we started up the slope though they did a better job of sticking together and arrived 10-15min after me. We took a longish 30min break at the summit, realizing we were in for more than we'd anticipated. All that time was more than Patrick needed to decide he'd had enough and would head back down. This was a little disappointing because we'd hoped to make a go of it as a group and we'd feel a little bad for him waiting down below for some unspecified amount of time, more than a few hours. But we knew enough about Patrick that once his mind is made up there was no swaying it, and so we bade goodbye at the end of our rest, Patrick heading back down the north side, Tom and I venturing west to the unknown. We would soon realize the worst brush was yet to come. The intial section leaving the summit was brushy but not too bad, and we soon reached the saddle with the much higher ridgeline that would lead us up and around to Chalk Peak, about 2mi all told. The ugly brush started up again as we started the climb to the ridge and would slow us down considerably - it would take more than two and half hours to get from one summit to the other. We spent much of this, about an hour and a half, on that first mile making our way to the higher ridgeline. Ugly, ugly brush, Tom commenting that it was one of the worst he'd ever encountered. It was certainly in the top ten for me, the kind of stuff that even I don't find enjoyable. We thrashed our way as best we could, Tom taking a beating, or rather a bleeding with short sleeves and pants. My pants would be close to tatters before we were through, though thankfully saving me losing skin to the same degree as Tom. Once we reached the ridgeline high above both Peak 5,428ft and Chalk Peak, the going became easier, pleasant even. The ground was sandier, the brush far more manageable, some trees, and swell views. It was so nice that we would have enjoyed continuing on the ridge all the way to its terminus at Telegraph Peak and jokingly commented that we should call Patrick and have him pick us up in Baldy Village. We might even have been able to get there before he'd have been able to make the long drive around the range. This was wishful thinking, of course, because we had Chalk Peak to visit, well off the ridge we were hiking along, and besides, Patrick would have rightly told us to catch an Uber rather than expect him to play taxi. It was necessary to first drop 800ft to a saddle before we could start up to Chalk Peak. Steep talus and sand slopes made the upper part of this fairly easy. Once down in the brushier drainage we found ourselves in, the going got rougher even though it had once again looked easier from afar. There was no obvious best side to the low ridge leading to the saddle and we tried one side or the other as seemed best. At times it looked like a use trail of sorts could be found but these were fleeting at best and we had to pause often to scratch our heads and figure out the least painful way to continue. With enough perseverance we eventually reached the saddle and then easier ground on the southwest side of Chalk Peak, reaching the summit just before 12:30p. We found a heavy steel pipe lying next to a small cairn and a single, faded sheet of paper from a small party a year earlier. We were hoping we might find an old, dated HPS register from years past like I had on Ortega or other delisted peaks, but this was not to be. The first half of the descent heading east went very well and pleasant enough, the second half not quite so. It wasn't brush this time but steep, poorly consolidated talus and small boulders that made for the slow, ankle-twisting sort of descent that makes one slow and cautious. I had chosen a line that took us down to a side canyon feeding into the North Fork. It was cool and shady here, the brush not too bad except for the appearance of poison oak which we'd so far eluded along the route. Carefully watching for the stuff, we made our way down the dry streambed, eventually landing on a very old roadbed that made the crossing of the wide North Fork streambed much easier. When we got back to the Grand Cherokee at 2p we found Patrick lounging in the back, listening to satellite radio to pass the time. He seemed much more relaxed than the last time we'd seen him atop Peak 5,428ft. By comparison, Tom and I were rather beat up by it all. Knowing we couldn't possibly continue with the ambitious original plan, we decided to see if we couldn't do a few more of the easier ones before calling it a day. Our first efforts to reach Upper and Lower Lytle Creek Ridges on the north side of the canyon were met by roadblocks preventing us from driving up Sheep Canyon and Applewhite Rds. We could have hike the mile or so up to the summits, but that was more than any of us cared for at the moment - we wanted a drive up, damn it. We found if further down the main canyon at Penstock Ridge where the fire had not reached and the access road was open. The road was in decent shape for any high-clearance vehicle where one is able to drive to within about 10ft of the summit at the ridge's highpoint. Patrick parked at a turnaround point and we walked perhaps 50yds to tag it, a short 15min diversion. This one does not appear on LoJ and had not been on my radar until a few days earlier when Patrick had mentioned it during our email exchanges. Found on PB, Patrick had noted it numerous times while driving Interstate 15 over Cajon Pass. Once back on the freeway, we drove north 11mi to Cajon Junction where SR138 crosses the interstate. Wye BM rises abruptly on the NE corner where we parked for the short but steep climb. While discussing which of us would be first to log the ascent on PB upon reaching the summit, Tom announced that he already logged it while we were standing there at the base. Patrick and I quickly denounced this move as "pre-logging" one of the more egregious offences one can commit in the age of digitial peakbagging. To drive home the point, I made it a goal to beat Tom to the summit and provide photographic evidence that he wasn't the first of our party to reach it. Believing such blatant disregard for protocol should not go unpunished, I took the time to write a short TR on PB to denounce him before he'd even reached the summit. We'll see if he tries this stunt again.